Somalia and tourism are not quite the words that usually go together in the last few decades. But Somaliland, on the other hand, is a completely different story. Although Somaliland is a part of Somalia, in many other aspects they are completely different. Somalia is famous for its pirates, but Somaliland is well known for its hospitality, especially to tourists. That is why you should definitively consider visiting this, more than interesting region. Somaliland – Where Is It Anyway? Somaliland is an autonomous region, located in northwestern part of Somalia. It is famous for its amazing beaches along the coast of Gulf of Aden. But the beaches are not Somaliland’s only natural beauty. Namely, the eastern part of the region is completely surrounded by high mountain peaks that go up to seven thousand feet. That is the main reason for a pleasant climate, which is quite cooler here than in other parts of Africa. The whole region is really beautiful, especially the Awdal region with its small offshore islands and coral reefs. This region is quite near Somaliland’s major tourist destinations – Hargeisa and Berbera, too. Hargeisa is its capital city. It is one of the safest places in Somalia and entire Africa, and Berbera is its biggest port and most important economy centre. Reaching Somaliland should not be a problem since there are two big airports in both Hargeisa and Barbera. All of the major cities have a very good public transport, which is perfect for getting around and exploring the region. Most of the natives are friendly and you should not have any difficulties while staying in Somaliland. Most of the people are quite confused when they hear a name Somaliland. It sounds almost just like Somalia, but there are a few differences. Namely, the entire country – Somalia – has a rich and colourful history. It has been a home to various native dynasties and cultures but it was also under the influence of other civilisations such as ancient Egyptian or Roman civilisation. In the early 7th century, Somalia has come under a strong Islam influence, which remained the dominant religion until the present days. The real trouble in Somalia began in the 19th century when different European countries started to colonise the entire continent. The British had finally gained control over the narrow coastline and the central parts came under Italian control. In the 1960s, Somalia finally managed to gain independence but the internal differences have soon started to show up. Unfortunately, the situation escalated in 1988 when the civil war began. It tore the country apart. That is why Somaliland declared its independence from Somalia in 1991 and it is recognised only by a few countries. Today, Somaliland is a peaceful region which is trying to rebuild itself. They have had democratic elections and started to invest in tourism. 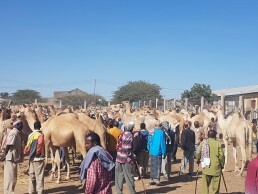 It seems that their efforts are starting to show some results since Somaliland has a continuous rise of foreign visitors each year. The best place to visit while in Somaliland is its capital city Hargeisa. It is a modern city which is developing fast, but also a perfect spot for new adventures. You should definitively visit its provincial museum where you can get all the info you need about this region. The history of a whole Somalia will probably be much clearer to you after this visit. You should also chek out the impressive monument called The MiGJet which is dedicated to the victims of the Civil War. Don’t miss the chance to enjoy the amazing nature around the city such as the twin hills of Naasa Hablood. Berbera is another great city worth visiting, and especially those who enjoy nice beaches should definitively not miss it. Berbera is the water-sports centre of the region. You can also take the nomadic tour to see the native way of living or a religion tour to check out some of the ancient holy sites and mosques. There many other attractions one should see but these are definitively those you must see once you arrive in Somaliland. Once you choose to visit Somaliland, searching for a suitable hotel is inevitable. Cities like Hargeisa and Berbera offer a list of good and affordable hotels. Hence, if you travel on a budget, you will not have issues in finding accommodation. The hotels in the centre of the city are perhaps the best solution since they are close to the main monuments, markets, and restaurants. In most of them, you will find a peaceful and quiet atmosphere. So, you will have plenty time to take a rest and enjoy your vacation. Thus, Oriental Hotel in Hargeisa is placed in the heart of the city and offers middle-sized and functional rooms with bathroom. The hotel has also a restaurant with decent food, but if you just leave it and go to one of the restaurants in the centre, you will quickly understand that food in Somaliland’s restaurants is far better than in Oriental Hotel. In addition, in case you have a light sleep, be ready for the early morning prayers from the mosque placed just next to the hotel. Another good choice in Hargeisa is Hadhwanaag Hotel. It is situated five-minute walk from the main tourist attractions. As with a previous hotel, you will surely get clean rooms with sheets, air condition, and plenty hot water, but it may occur that you ask for a fan several times. Personnel is nice and polite. However, it can happen that they forget about something or they do not understand you entirely. The good thing about Hadhwanaag Hotel is that their food in a restaurant is so delicious that you could just remain in the hotel for couple more days just to have meals. You may also consider Jirdeh Hotel Hargeisa, which is a bit farther from the centre of the city but has nice rooms and excellent prices. It is a good option to think of as well. Finding accommodation in Berbera will be harder perhaps since hotels in this city are almost always booked in advance. One could say that hotels in Berbera are full during the whole year. An excellent solution is Maan-Soor Hotel. It is not placed in the centre of the city, but it will surely surprise you with its offer and security arrangements. 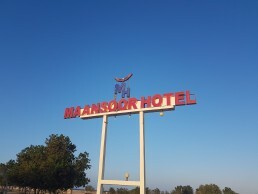 Maan-Soor Hotel looks great on the outside as well as on the inside. The rooms are somewhat simple but very clean. Of course, the food in the hotel is outstanding, so be sure, you won’t be hungry in Somaliland. Eating in Somaliland means tasting a delicious Somali cuisine. Although restaurants in Hargeisa, Berbera, and other cities will turn to offering you western food, don’t eat it, because traditional Somali food is so much delicious. Their cuisine is influenced by different other traditional cuisines, such as Arab, Turkish, Yemeni, Persian, and many other. Food in Somaliland is cheap, and not so diverse. But one thing is for sure – you will eat a lot of camel meat in Somaliland. Also, be prepared to eat loose rice with your bare hands because the Somali eat it this way. No breakfast can pass without eating lahooh, a spongy pancake-like bread. It is sweetened with sugar and honey and then soaked with a cup of tea. Don’t leave the country without trying it. You will be thrilled by lahooh, for sure. There are also different sauces on the offer. For instance, green chilli and coriander sauce are well-known and popular in Somali cuisine, and it is added to meals on a daily basis. Thus, if you start wondering what is that green stuff in a bowl, just remember it is tasty and don’t miss adding it to your camel meat. 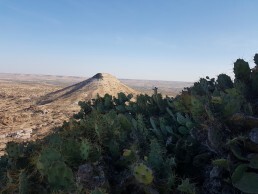 Although you may think that Somaliland is quite unattractive when it comes to activities during your visit, you have the wrong idea of the country. Hence, you can go shopping on some of the most interesting markets in the country, you can go diving, or beach wandering during the night. But perhaps the most interesting spot is Laas Geel, on the road between Hargeisa and Berbera. 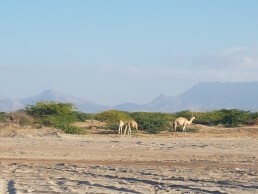 Laas Geel will undoubtedly provide you with a lovely landscape of Somaliland. It is a place where you can visit amazing caves with extraordinary views on the entire region. 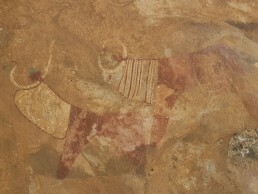 Laas Geel also holds the oldest cave paintings in Africa dating back from 9000BC, they are among the best preserved in the world for their age. 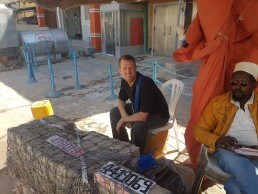 Hargeisa has a lovely market that is suitable to visit in the afternoon. You will find vendors sitting in their chairs and drinking tea with their colleagues, and they will always be extremely friendly and ready for small-talks. Markets in Hargeisa will offer you everything you may imagine, from raw meat to the finest perfumes, jewellery, and clothing. The Berbera beach is not a famous place for its clean sand. On the contrary, you will surely find a lot of trash along the beach while taking a walk at night, but what you certainly won’t find is another tourist. Namely, only locals gather at night in this place. They play in the sand or go for a dip. Have you been to Somaliland? would you be tempted to visit? Let me hear your thoughts in the comments below. Look at all those camels! This is such an interesting post! I had never heard of Somaliland, but love the background you gave and the beautiful images! I am really trying to step out of my comfort zone as it comes to travel, so I would definitely be willing to give it a visit if the opportunity presented itself! The camel market was amazing, It was such an incredible experience. If it presents itself I would say definitely take a visit, you will not regret it. 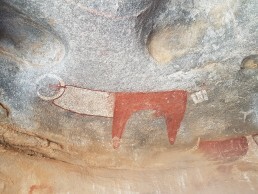 I have never read a post about Somaliland so I found this really interesting – you’re right people don’t usually put it together with tourism! And camel meat?! I’d be interested to give that a try! I think I must be amongst the first to use tourism and Somalia together 🙂 Camel meat is quite strange and pleasant, once you get over the fact its camel, it tastes like Lamb to me, mine was always in a stir fry so cooked well done and slightly tough. What a unique place to travel! How does camel meat tastes? Very unique place and i’m so glad I visited. Camel meat is quite strange and pleasant, once you get over the fact its camel, it tastes like Lamb to me, mine was always in a stir fry so cooked well done and slightly tough. I’d seriously never heard of Somaliland before, thanks for such an informative article! As for Camel Meat…well, if it’s good enough for the locals we should definitely give it a try! I hadn’t heard of Somaliland neithier until I started searching Somalia. I agree, if its good enough for the locals it’s good enough for me. I’ve always been so interested in this area! Great info here. Hopefully I’ll get there someday! I’m glad you enjoyed the info and I hope it’s useful to you, and that you get there someday. U welcom at somaliland. One of the most peacefull areas in africa. Thank you Abdiqani. Yes Somaliland was very peaceful and also very beautiful, I hope you enjoyed my article as much as I did visiting. i had never heard of that region but it seems full of beautiful landscapes and interesting actvities. It certainly is full of beautiful lanscapes and intresting things to visit. I can’t belive the things I’ve learnt from being here. I’ve never been and have never thought of going but now it’s in my mind! It seems like a very interesting place to go to! Not many people have heard of Somaliland, perhaps because it is still sort of Somalia, it is certianly an intresting place to visit and one that i’m glad I have. Never heard of Somaliland, so very interesting read! How did you came across this destination? I hadn’t heard of Somaliland neithier until I started searching Somalia. I haven’t read a post on Somaliland so this is very interesting to me. Laas Geel seems like a place I would want to visit being a historian. Camel meat seems very interesting. Is the taste very different from beef? To be honnest, I’d hadn’t read a post either, I came across Somaliland by searching about Somalia and then read up little parts from media reports etc. Laas Geel was an incredible place to visit and best of all, I had it to myself, no stampede of tourists. Camel meat is quite strange and pleasant, once you get over the fact its camel, it tastes like Lamb to me, mine was always in a stir fry so cooked well done and slightly tough. What an unusual place to visit! Fascinating read as I’ve never heard of it. So rich in history and culture! It has to have been one of the most fascinating places that I have visited, learning about their history and culture along with the civil war made for a very interesting visit. If you’re planning a visit then make sure to keep an eye out for my next two posts on South Somalia and Puntland. all three regions are different. next articles will be in about 1 week. When I started of reading this article, felt Somaliland was a city in Somalia. Had no idea that this an independent nation. I had never heard of this area, but now I am in the know. Sounds like a fantastic place to relax and recharge. I’ll keep it in the back of my mind during our travels. Thanks for sharing! I have a friend from college who is currently teaching in Somalia. Her photos are stunning. Somalia does have a reputation for being a more dangerous country to visit, but after visiting El Salvador and Honduras last summer, I’m really not convinced that all these places are as terrible as the media says they are! What does camel meat taste like, by the way? Wow a friend teaching in Somalia, that is very brave, depending on which part, does she have a blog? but as you have rightly said, not all places are as terrible as the media says. Just like anywhere in the world, if you take caution, be respectful, most are friendly and welcome you to visit. I read about Somaliland when I was traveling to Ethiopia, but never thought about visiting it by myself. From where did you fly to Somaliland by the way? And with which air company? I didn’t fly into Somaliland, I travelled by road from Ethiopia across the boarder, then headed into Hargeisa. Well, just to step in here, you can travel by air either through Addis Ababa, Dubai or Djibouti. 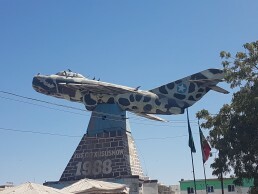 There are direct flights daily to Hargeysa, the capital of Somaliland. Fly Dubai and Ethiopian airlines fly regularly to Somaliland. It is where I from, and am sure you will have enjoy it. That is correct you can, I should have answered that really, sorry. I just said the way I did it. Flying is a great option too and very easy done. I have to say I have never read anything on Somali so this was inserting! I think whenever you have markets and beaches to visit it is a win win! I had never heard of Somalialand. Glad to know it is different than Somalia, though the only thing I really know is that they have pirates. Chicago has something like that in the states, Chicago and Chicagoland. I have never heard of Chicagoland. Im going to have to check that out. No pirates in Somaliland. Just puntland and south Somalia. Camel meat…I bet just like horse meat. Somaliland looks inviting. Camel meat tasted like lamb, tough lamb. 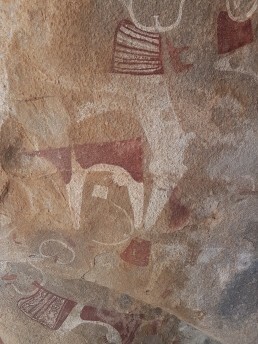 I’ve really wanted to go to Laas Geel and see the cave paintings but we didn’t make it when I did Cairo to Cape Town. Its great to see someone else going to those off the beaten path places. I gonna have to tell you, you really missed out. Make sure you fimd time at a later date. They are so worth it. Thank you for this post!! I’m planning to visit Somaliland later this year when I’m traveling overland from Cape Town to Cairo. You’re welcome, I hope it has been some help to you. Have a great time. Be sure to see those cave paintings. Oh and climb the virgins breasts. Thank you, Yes I love your counntry too. A beautiful place! Thank you very much indeed kevins traveler for giving beautiful pic of somaliland, also cheers to other freinds liked this. A humble Somalilander here! thank you for sharing our beautiful culture with the rest of world. Thank you, you’re welcome. You have a great country 🙂 show all your friends that I enjoyed it there. Kevin I couldn’t be more happier to see a positive article about my country Somaliland. The rest of the world dont know the difference between Somalia and Somaliland, which makes it hard for great people like you to know such difference until you close your eyes about what the media says and find out for yourself. Thank you so much for sharing your trip experience with us and also encouraging other great tourists to visit Somaliland. I’m glad my article has shared some happiness, share with your friends so they can be happy too. 🙂 Yes, the rest of the world don’t know or understand but I hope they will now. It is a shame what the media portrays Somaliland with Somalia but I hope my article shows light in Somaliland. Thank you very much your beautiful and interesting article about my country, Somaliland. We would like to welcome every who interesting to visit this country. i would like to request Kevins to write an article comparing Somaliland and Somalia including historical background after Berlin Conference, different independent time and different colonial countries, different, flags, currency, boundaries, army forces, after your next 2 coming articles about what is called Italian colony(punt-land and South Somalia). You’re welcome, I hope you enjoyed reading a positive article!. What a great request and a great article. I have a few article to write but that sounds like the perfect article to write. Give me a while and I will do that article and I will let you know once I have done it. Perfect idea, thank you. To give best hospitality to our guest is our culture,by the way thanks to kevin travek agency. This is very interesting article about Somaliland. A place most of the people don’t know. Hospitality is one of the characteristics od Somali’s. I am sure there will be plenty of historic sites to see. Thanks for sharing your views and finding in Somaliland. Look forward to see read more of your articles about Somaliland. Thank you, I’m glad you have found this post interesting. There are many historical sites to see and they are certainly worth seeing. Thank you Mr Kevins. What a good article, what a perfect reporting. Thank you Mahamud, I’m glad you enjoyed this post.